The first white man to see the area around Aberdeen was probably the Assistant Surveyor Henry Dangar who passed Muscle Creek on his way to Dartbrook in 1824. Other explorers such as William Nowland and Allan Cunningham also passed through Aberdeen in the late 1820's seeking a new route North. The original owner of all the land between Scone and Aberdeen was Potter Macqueen. 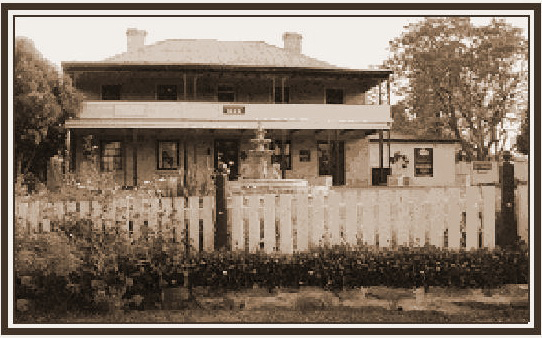 In 1831 Macqueen and his wife arrived to take up residence at their property "Segenhoe" and at Potter Macqueen's request, an adjoining reserve 10 kilometres south of Segenhoe was made a village and named in honor of Macqueen's friend George Gordon, the 4th Earl of Aberdeen. Thomas Smith Hall, son of George Smith Hall, who was granted the Dartbrook Estate, essentially created the Australian Cattle Dog. 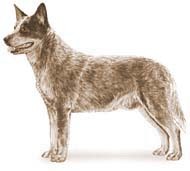 He crossed the blue merle Scotch collie with the native dingo, in pursuit of good working dogs. The result became known as a 'blue heeler', for the colour of its coat combined with its tendency to nip at the heels of cattle. and today offers first-class accomodation to its guests. In 1862 Peter Doyle purchased land on the southern side of Aberdeen, and built his home there which he called "The Grange" for his family. 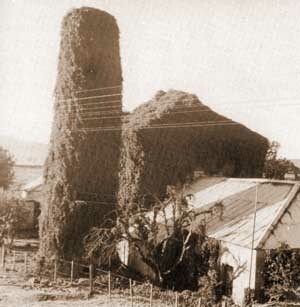 The house is still standing, although it has seen better days, and was associated with the Holloway family for a number of years. Long gone are the days when Marge Holloway's pony club met there on Saturday afternoons. The children would go from her house, and ride through the main street to the showground, on the northern side of town. In those days there was hardly any traffic, as all the freight went by rail, and cars were much fewer, and far between. From 1914, and up to the 1960's, the hub of the town was Campbells store. 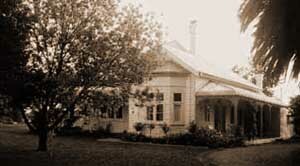 The head office and main shop was in Muswellbrook, but there were branches in Aberdeen, Scone and Merriwa. 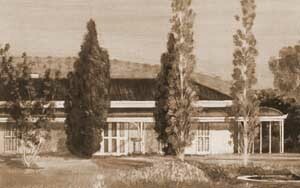 However, by the 1970's the era of the country town department store was over, and the building sadly sold. Since then it has had a succession of different uses. The Aberdeen Meatworks was founded in 1890, and was the town's main employer for over a century. However changes within the industry, has seen the closure of many country-town abattoirs, in favour of the larger, more centralised operations. In this light, the Aberdeen Meatworks closed on 16th April 1999 for the last time, and put 400 men out of a job. The human cost is tragic, as it not only puts men out of a job, but brings hardship to their families, and strikes a mortal blow to the town itself. It is to be hoped that other opportunities will arise in the area, and that the town will be able to ride this one out. An old homestead and formerly a bed and breakfast, between Aberdeen and Scone. 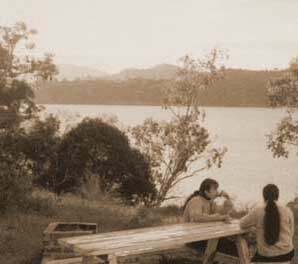 Having a picnic overlooking Lake Glenbawn in 1972. Aberdeen is situated 273km north of Sydney and 186m above sea-level with a population of around 1750. A small town in the midst of pastoral and agricultural countryside situated beside the Hunter River between Muswellbrook and Scone.